Haripriya R, Thirumalaivasan P. Harbouring of bacterial cellulase gene into Zymomonas mobilis for cellulosic ethanol production. European Journal of Biotechnology and Bioscience. 2015; 3(3):24-30. Journal started from July, 2013. 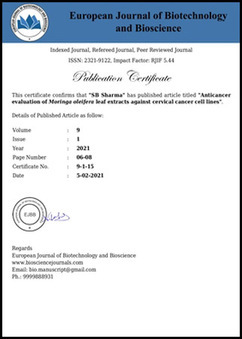 This Journal is publish regularly from July, 2013 and bimonthly regularly.